For Americans of all strata, individual freedoms are important. Our freedoms assure us the right to free speech, to practice our religion, to protect ourselves, to exercise our political rights by vote, and even to dissent and bring up grievances against the government. Moreover, while some of our individual and states’ freedoms are “enumerated,” many of them are implicitly understood, and so they are not listed in these first 10 Amendments or the Bill of Rights. However, just because they are not listed does not mean that they are unimportant. But they should not be looked upon in the distorted fashion that Libertarians make in that the founding fathers intended for individual’s rights to overcome the rights of others. More importantly, nor should they be looked upon as the only important standard in our life. 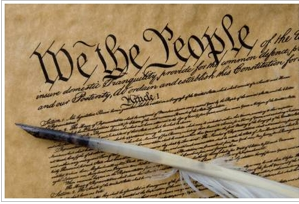 Our natural rights in the Constitution emanated from an idea that our nation and laws were built around the notion that we are a community whose principle goal is unity and the preservation of the Union. As Jefferson argued in the Declaration of Independence, our liberties are endowed to us by our creator so the saying goes. Other liberties are stated specifically in the U.S. Constitution. However, Jefferson also drew from Rousseau, the idea that any form of community would “corrupt” the innocent “noble savage” who roamed freely in a “total state of freedom." Essentially, for Jefferson, any religious principles or government that brings “man” into a community would result into a corrupted society. Hence, Jefferson ardently opposed a centralized strong government that could violate man’s right to roam free or infringe on the rights of states. But unlike the purist Rousseaunean views of Jefferson, Madison (like Locke) believed on the concepts of a community, made up of religious groups, and a community of legal states—colonies, with a Constitution as the guiding document for unity, by a community and for a community, which in this case is the United States. Therefore, the notion that Libertarians individual rights are to be more important than those of the United States, or the community, is a clear misinterpretation of our political and legal rights “enumerated” and ‘implied” in the Constitution. But none of these liberties, enumerated and implied," teach us the basics of how to treat each other nor do they speak to us about societal inclusion. These are values that are taught to us by family, religion, social interaction. Without these basic understandings and applications, an individual is not able to be included in the everyday of life we call society. These rules and regulations are stated already in the Constitution and are a guide as to how we are to include groups and people into our society. Libertarians view things as a micro perception looking around to see only themselves and looking to protect only their rights. While this is the epitome of what Libertarians believe, it should not be misconstrued to mean that is what a Constitutionalist really means. Constitutionalism means to protect the liberties of a community ideal that will build a strong America. A constitutionalist believes in those amendments that seek to protect the voice of America which includes the liberties attributed to the Bill of Rights. A constitutionalist sees the fabric of America and does not seek to contain our freedoms so as to benefit the rights of just one because to do so would create a state of chaos. For example, the 14th Amendment and the “due process” clause seeks to protect and defend those liberties and rights that are not spelled out specifically. Out of this specific clause, “due process”, the Supreme Court was able to carve out important legislation that would protect the rights of Groups to have the ability to have a voice in our society. It was not meant to replace the rights of others, but to include the rights and integrate those who were separated as not having rights in the United States. Subsequently, a Constitutionalist believes in a small and cohesive government. A Constitutionalist believes that those who are in the government should be guided by the U.S. Constitution. This would include the right to free speech, the right to own property, the rights to vote and the right to practice religion. Libertarians rarely talk about the practice of religion and instead speak to the “leave alone” policy for everyone to do their own practice. Again, not only does this alienate groups of society, it also begins to unravel the cohesive glue that the 14th Amendment seeks to mend and that is to help integrate groups into the American society. Libertarians seek to protect the rights of the individual at all cost. A Constitutionalist will look toward the U.S. Constitution to develop the protection as it is in the best interest of the country. So then why are Ron Paul supporters confused about whether he is a Libertarian or a Constitutionalist? Ron Paul himself has stated that he is a Constitutionalist who believes that the U.S. should be governed by the Supreme Law of the land, the U.S. Constitution except that the individual liberties should not be infringed upon by the greater group. A Libertarian and a Constitutionalist differ on basic and important principles. A libertarian's view does not include the rights of a Constitutionalist who acts on behalf of the best interest of America. So before we back an individual and his philosophy, let’s listen to his terms and understand their definitions.